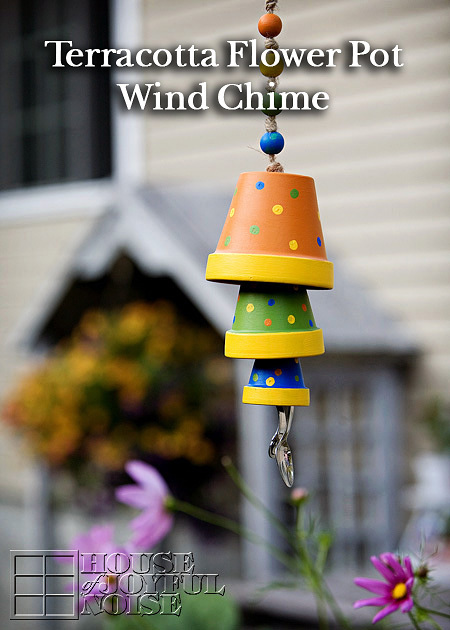 Last week I was visiting one of my favorite blogs, TidyMom. (It truly is a place for everything! ; ) Cheryl over there was sharing a recipe for her Homemade Peanut Butter Eggs. Ohhhh, how I wanted one! In fact, I have been missing Reese’s Peanut Butter Cups, and the Reese’s PB Eggs that come out every Easter, for years now! But peanut and peanut butter anything has been removed from our life, since we discovered our son has a severe, life threatening allergy to it. It was a hard pill to swallow, for this life-long-die-hard-peanut-butter-lover. But Sunbutter has helped me survive. And anyway, I love my son way more, and keeping him has been worth the sacrifice! Sunbutter can be found in the organic section of most grocery stores. We love it so much, we order it online by the case, and also because it is cheaper that way. Now, as anyone with a peanut-allergy child knows, Easter and Halloween especially, can be quite the challenge, when it comes to finding a few treats and candy for our kids! This is because so much of anything with chocolate, has a real risky potential to be contaminated with peanuts, within the factory manufacturing. And most packaging even says so. That being said, I have wondered right along, how well any recipe that calls for peanut butter, could be substituted with Sunbutter! 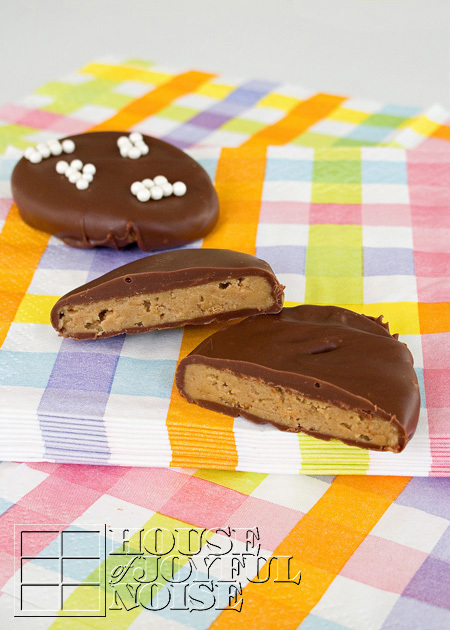 When I saw TidyMom’s Homemade Peanut Butter Eggs, I knew it was time to find out! And guess what? It was a delectable success! 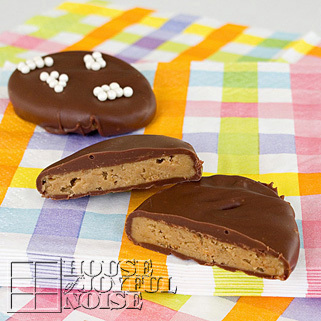 Sunbutter tastes very similar to peanut butter, to us, and these eggs bring all of the joy to our mouths, that Reese’s Peanut Butter Cups/Eggs ever did. This is how they came out lookin’!….. So, I thought I’d share how we did it with you all. 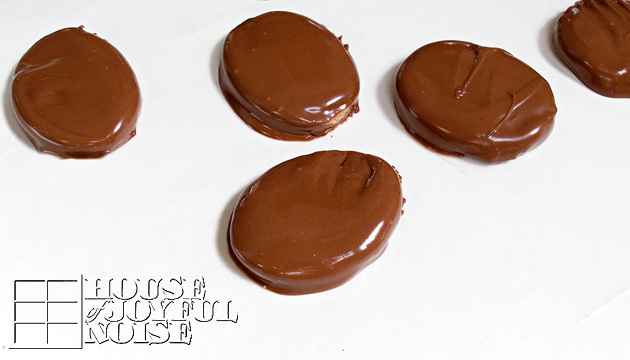 Now, if peanut allergies are not an issue for your family, and you’d like to make your own peanut butter eggs, you are welcome to follow (Cheryl’s) TidyMom’s Recipe. If you’d like to try the Sunbutter version, you can follow ours right here. Our recipe using Sunbutter here, was experimental, but we were just switching out the peanut butter from Cheryl’s recipe. (I did make one little tweak I’ll mention.) I got a little help from my husband, because I needed to take photos too. But we might have done some things a tad differently, just trying to find to make it work for us. It did get messy as Cheryl said it does, but like any project, once we get going and figure things out, we find our groove. 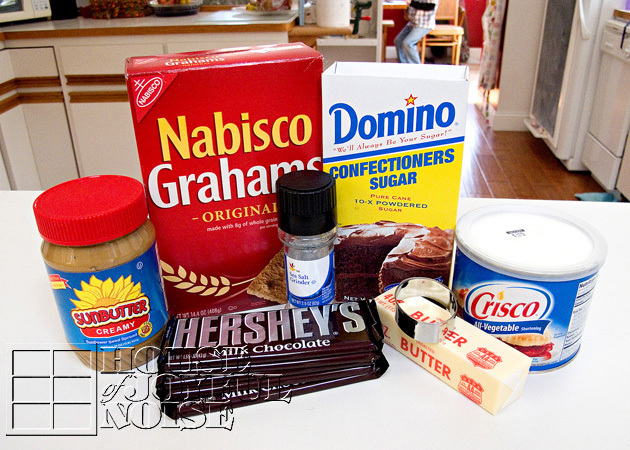 In a large bowl mix together peanut butter, butter, graham cracker crumbs, powdered sugar and salt until well combined. We used our Kitchen Aid, stopping it once and using a spatula scraper to get it all to the middle and off of the attachment. It was while mixing that we decided to add that extra 1/4 cup of graham cracker crumbs, for a total of 1 cup, to make it a little less sticky. Next, put the whole (Kitchen Aid) bowl into the freezer for a few minutes, to get it easier to work with. Then we plopped the whole mix on a big piece of wax paper, covered it with another piece, and rolled it out. 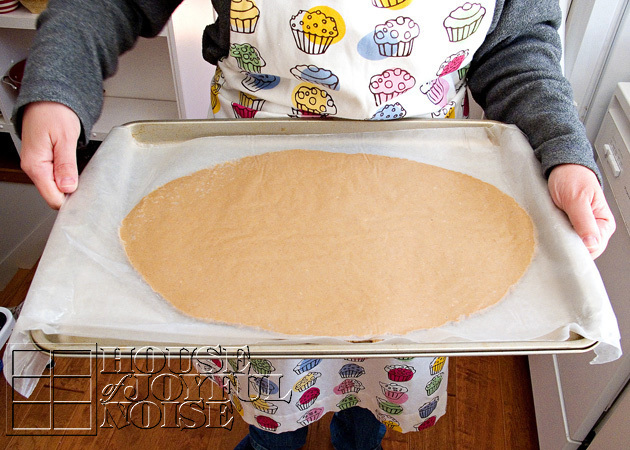 Then we placed the whole rolled out dough between the wax sheets, on a cookie sheet. 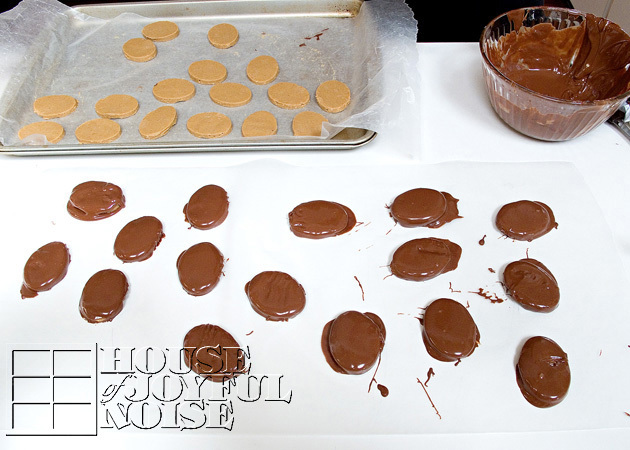 We then placed the whole cookie sheet back into the freezer, to help really firm it up. We left it in for maybe 15 minutes. 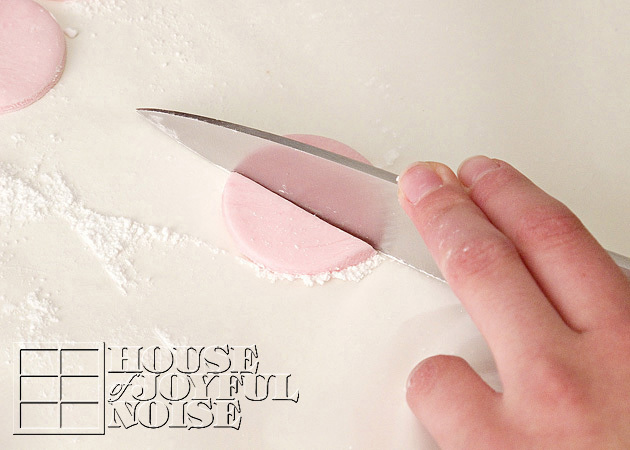 After removing the tray from the freezer, we put the wax papered dough onto the counter, peeled off the top sheet, and got cutting with our little egg cutter, right away. 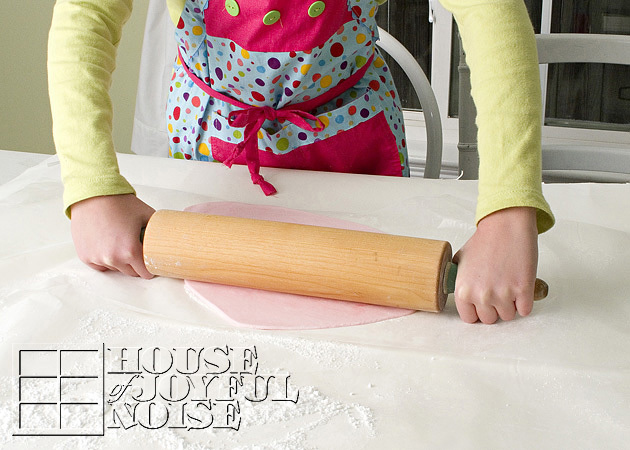 It’s important to work quickly, because the dough softens quickly, depending on how warm it is where you are working. We rubbed just a dab of shortening all over the cutter, and because the dough was really firm from the cold, and the eggs cut out really nicely. 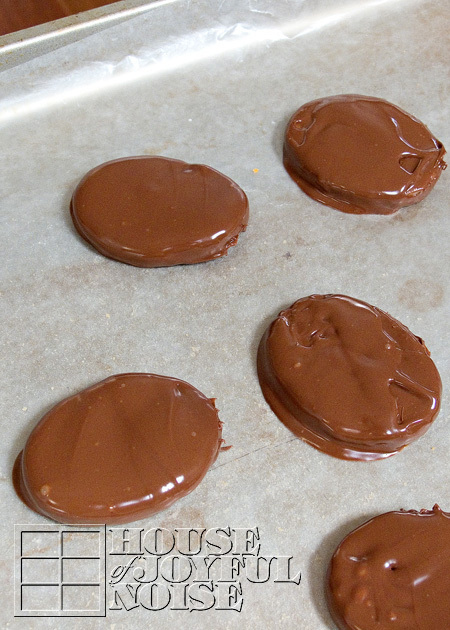 We placed them on another cookie sheet lined with a fresh sheet of wax paper. Again (not shown), we put the cut eggs back into the freezer to firm up once again. 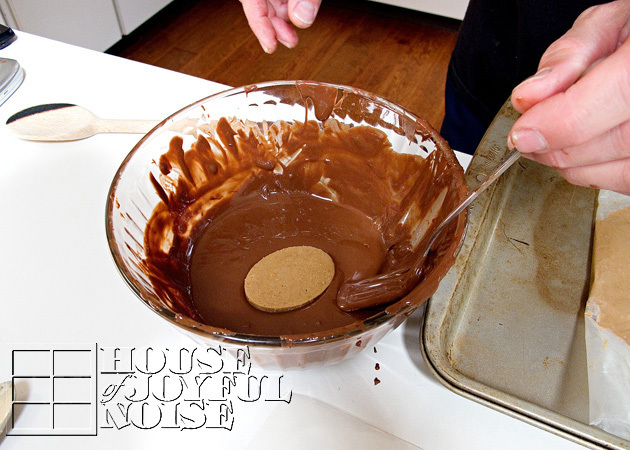 Meanwhile, we broke up all of the Hershey chocolate bars into a bowl with a tablespoon of shortening, and melted it. Using the microwave, put the bowl in on high for 20 seconds to start. Remove, and stir with the handle of a wooden spoon. It’ll still be chunky at this point. 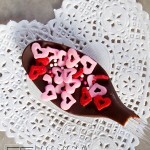 Put in for another 10 seconds, and another 10, always stirring in between intervals, until the chocolate is all smooth. 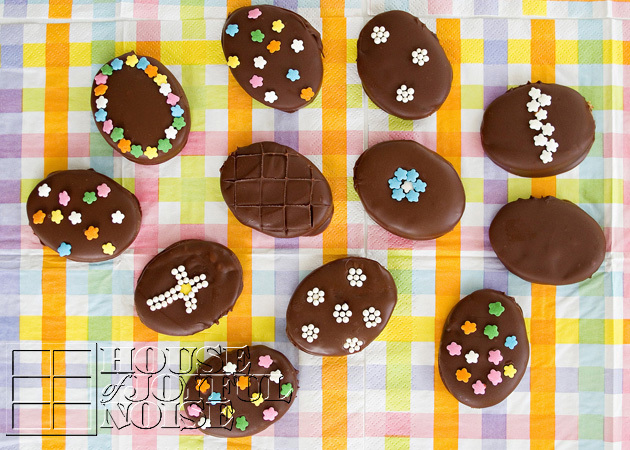 By the time the chocolate is melted nicely, the eggs should be nice and cold. So remove the tray, have another freshly lined tray ready, and get dipping! 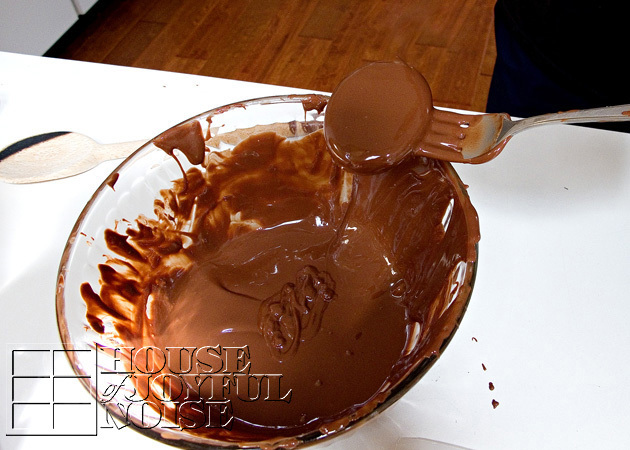 Now remember, the chocolate is pretty warm, and you want your eggs to stay as firm as possible, so you need to get that egg in and out of the bowl quickly! We just let them belly-flop in one at a time, flipped it over and lifted it out with a fork, as seen in the next photo as well. 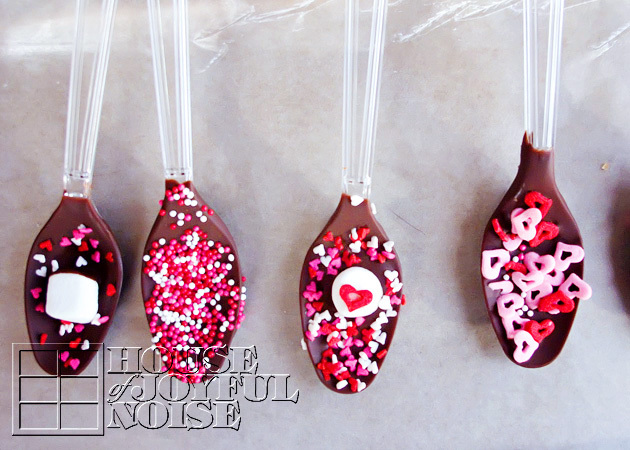 Just tap the fork on the side of the bowl to remove the excess dripping chocolate off as best as you can, and then gently let the chocolate covered egg onto the cookie sheet. This photo is just to show you what happens if you don’t get the egg out of the bowl fast enough. It goes soft very quickly. If at any point you think your un-dunked eggs are getting too soft work with, it never hurts to pop them back in the freezer, again and again. ...and other went on a lined cookie sheet. 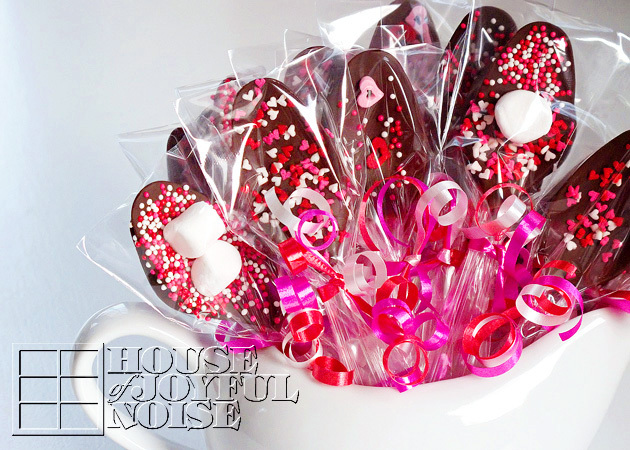 Once they were all dipped, the first one’s chocolate was firming up enough, that we could decorate them a little. We just used various sprinkles for some. My oldest daughter is great at decorating. Such patience! So she was in on the helping there. After we were done decorating them, once again, we wanted to chill them again. There was one more thing we wanted to do to ours, before taking some photos of them….. If you like to try and perfect anything you can, when you can (raising my hand..), we figured out a way to clean our egg’s edges up a little bit…. 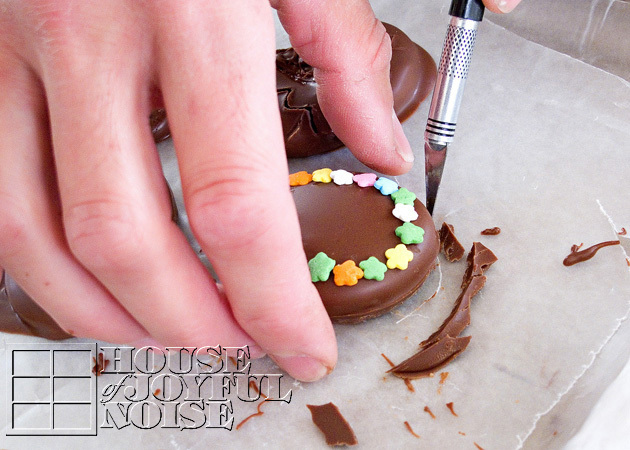 Using a clean x-acto blade, just trim off the excess chocolate that dripped down and spread when placing the eggs down. We didn’t do it to every single one. Just the ones that really needed it. These are just some. Some of the eggs we left as plain chocolate, and others we kind of drew in with a toothpick when the chocolate was just firming up. Do you see the criss-cross one? That one I used a french-fry cutter plate. Just placed it down, and lifted! 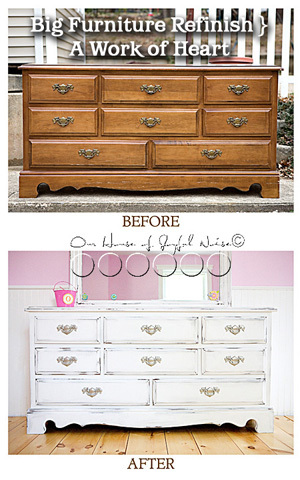 Look around your utensil and kitchen tools drawers, and see what you can find to use, to make some neat designs! We were really happy with how well they came out. Cute! 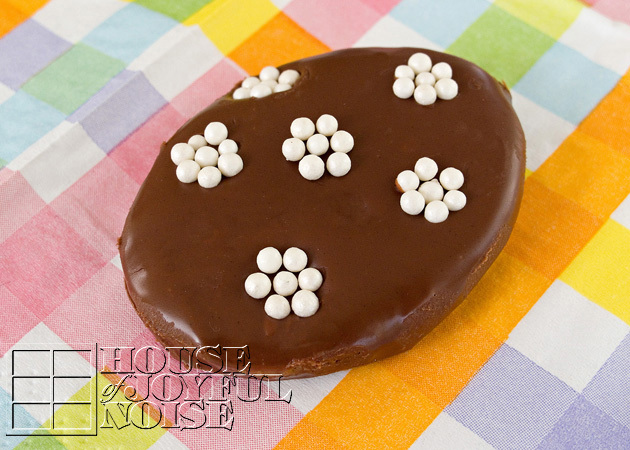 The salty-sweet melty party in your mouth is just divine! What I really love about them too, is the little crispy-crunch surprises, from the graham cracker! 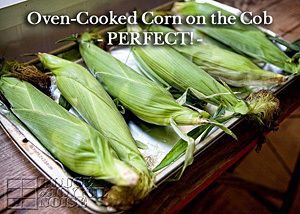 Special thanks to TidyMom/Cheryl, for the inspiration, and allowing us to adapt your recipe! Love it? PIN it, or share it! And come join us on FACEBOOK! We’d love to have you. If you’d like to print this recipe, just cut & paste the whole thing to a document, and delete any photos or paragraphs you don’t need before printing. We love granola around here! It’s such a good and wholesome snack, handful after handful, with CrUnCh! (Oh, how I love crunch.) It’s really a great way to start your day off right too, in the morning! Throw some in a bowl with a few splashes of cold milk, or load it on top of a serving of yogurt! Unfortunately, it’s next to impossible to find ‘peanut-safe’ granola at the markets. Added to the allergies now, is cashews and pistachios. Even small amounts of granola are kind of pricey to buy, ready-made, anyway. So, if we want granola (and we do! 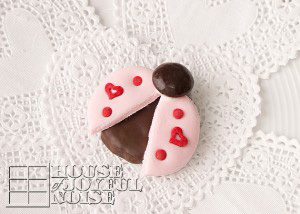 ), it’s up to us to make it homemade. 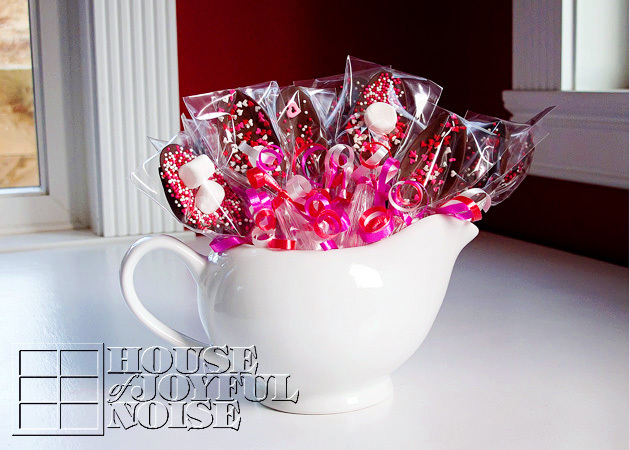 But we don’t mind, because it’s easy and fun to make, and we can make BIG batches. 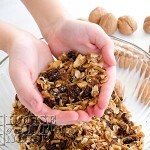 We have posted another granola recipe here on the blog before, and that one can be found here. 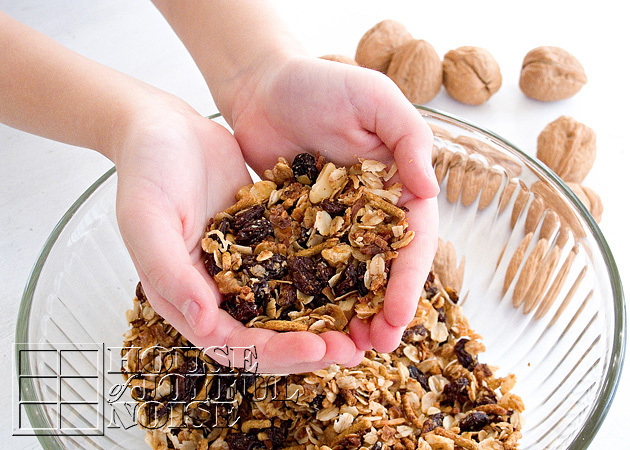 There is so many ways to make granola! Experimenting with different ingredients, is half the fun and surprise! Here is the granola recipe we’ve been crunching on this week! Preheat oven to 350 degrees. Combine dry ingredients in a large bowl. In a small saucepan, combine oil and honey. Stir over low heat until the honey is melted and it’s warm and blended with the oil enough. (About 5 minutes.) Stir in vanilla. 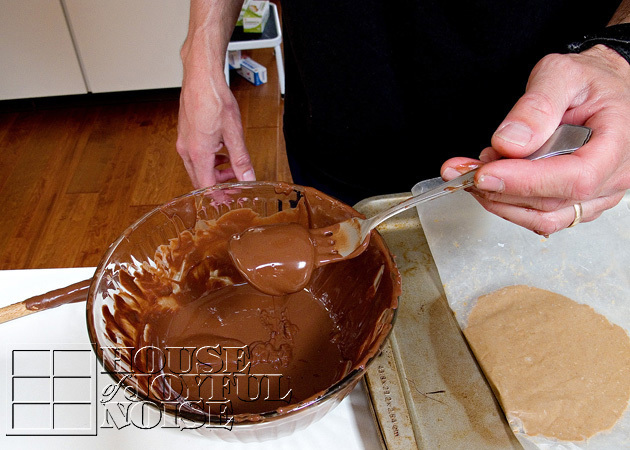 Pour oil mixture over dry ingredients, little by little, mixing to blend well. Spread mixture on two cookie sheets, and bake for for 15-20 minutes until lightly browned, stirring and flipping mixture over about half way through time. Let cool completely. Store in an airtight container. Makes about 12+ cups! There is nothing like a good granola! 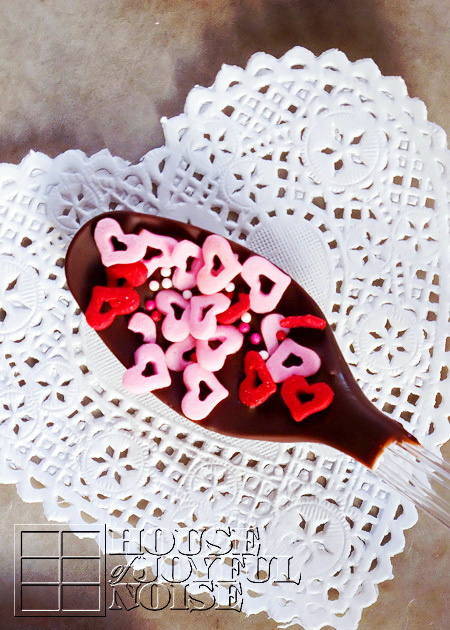 Here we are sharing our recipe with you, in hopes you'll enjoy it as much as we do! In a small saucepan, combine oil and honey. 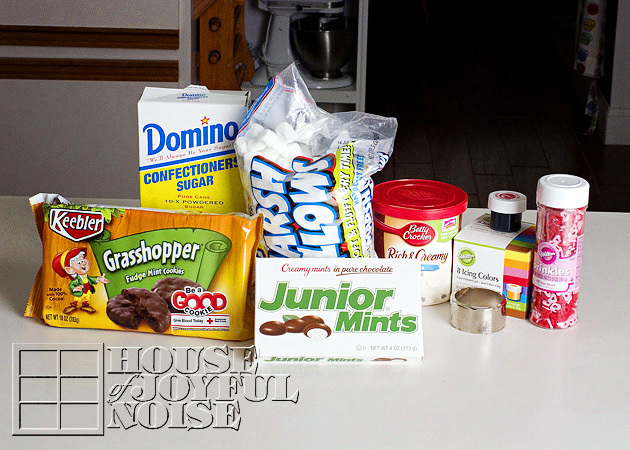 Pour oil mixture over dry ingredients, little by little, mixing to blend well. Spread mixture on two cookie sheets, and bake for for 15-20 minutes until lightly browned, stirring and flipping mixture over about half way through time. Store in an airtight container. Makes about 12+ cups! Does the word fondant scare you? Ever heard of the stuff? I know it makes more than a few nervous. But it can actually be a LOT of fun to play with! (Think Play Dough. 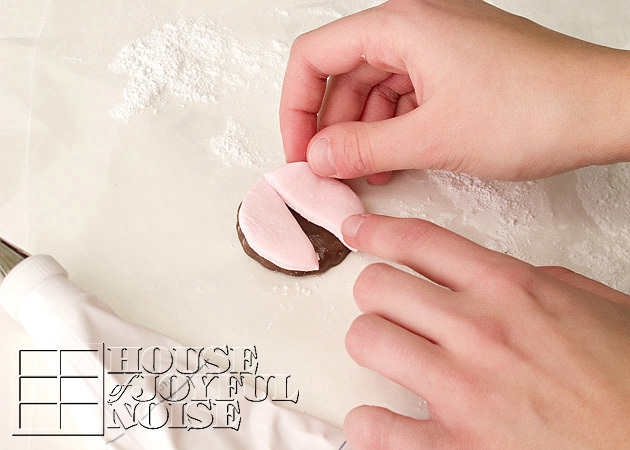 ; ) Truth be told, in this recipe, we did make and dye our own marshmallow fondant, simply because we knew how, and we think it tastes a little better than store bought. But you don’t have to! 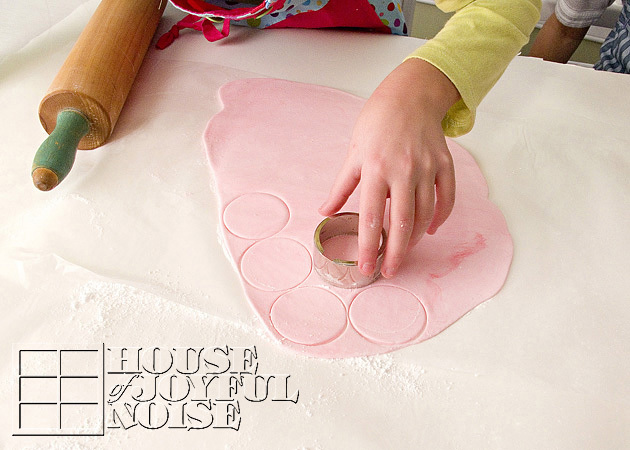 Rolled and ready fondant is available in craft and baking supply stores, and even comes in colors! I know Wilton sells ready-made fondant, but I heard a brand called Satin Ice, tastes better. I see that the Satin Ice brand is available to order online. I’ve seen it in a container so you probably roll that out yourself. I have not tried it yet, but I will. 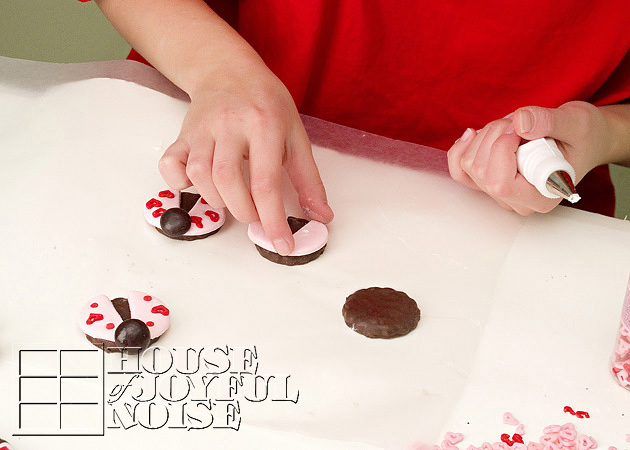 But if you’d like to learn how to make your own marshmallow fondant like we did, we have a tutorial coming up on that. 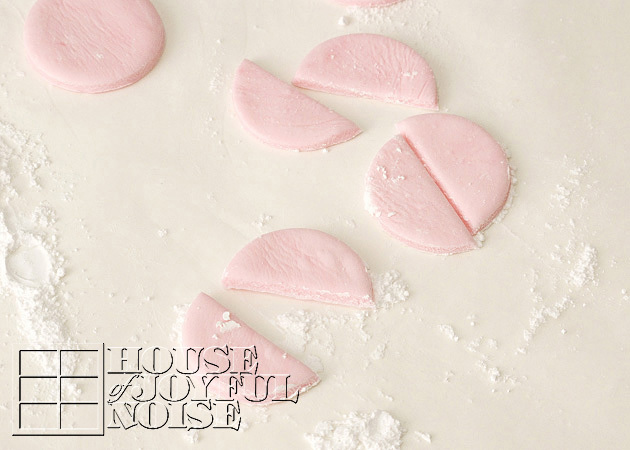 For today, we’re just going to show you how simple it is to put together these cookies, with some light pink fondant all ready to go! * One of our boys has a serious peanut allergy, so we are always checking ingredients carefully, for his safety. 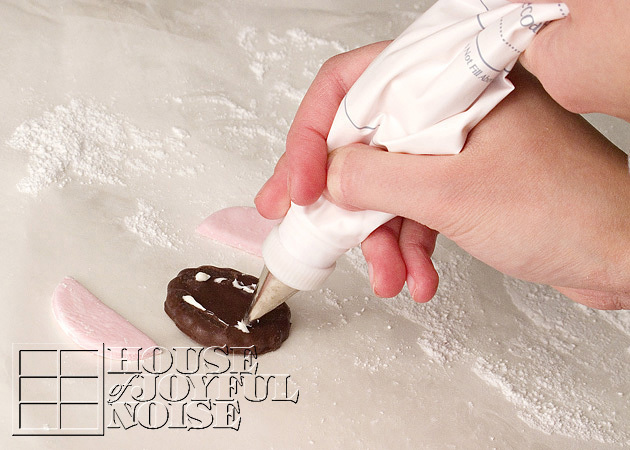 We rolled out our fondant on wax paper and a little dusting of confectionery sugar, making sure to roll it thin and even. 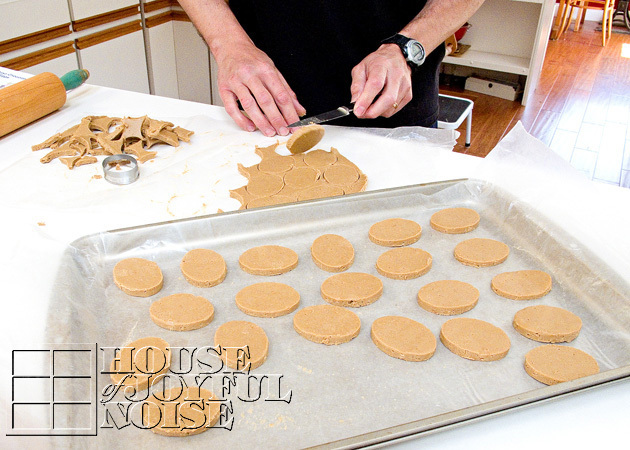 Next, we cut circles out of the fondant. These will be the wings. 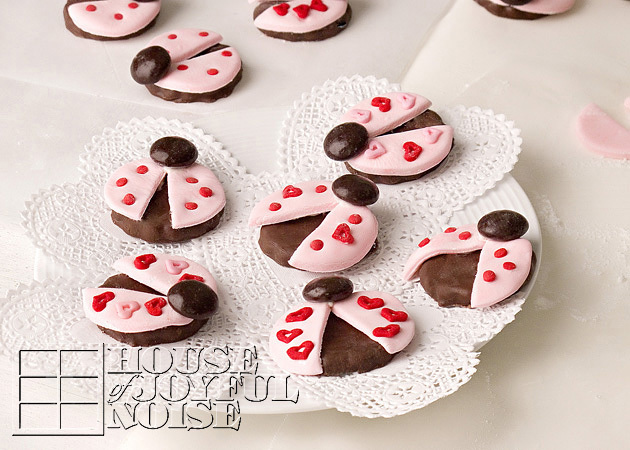 We started with this small cookie cutter, but it turned out to be a little bigger than we wanted the circles to be, as the cookies were smaller than this. 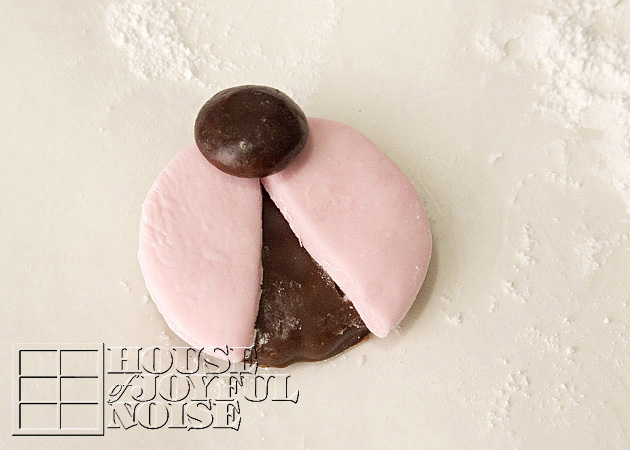 It was the smallest actual circle cookie cutter we had, so we needed to improvise. And so the search began throughout the house, to find something that will cut the circles smaller. Phew! Good think we have a drink now and then! 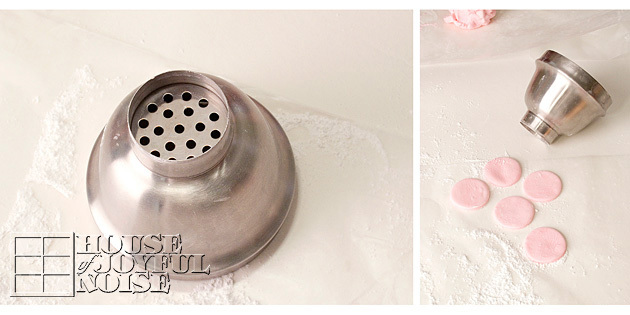 ; ) This shaker/mixer top turned out to be just right! Cut the circles in half, and the wings are done! I told you! Easy, right? It’s mere assembly, from here on out, Friends. 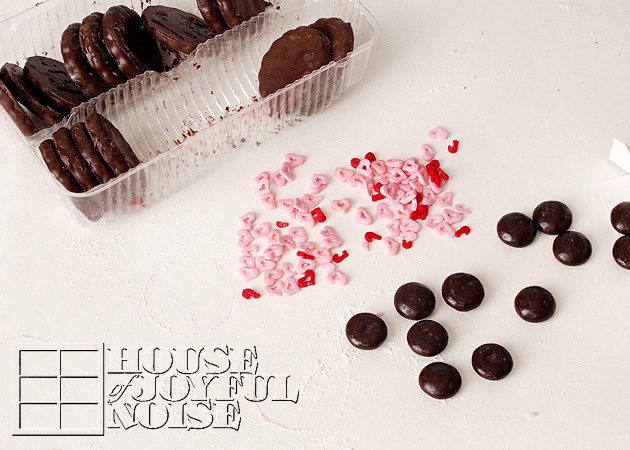 Put some of that icing in a piping bag, with the smallest tip, and just put a little on each side of the cookies. Put the wings on, as shown above. 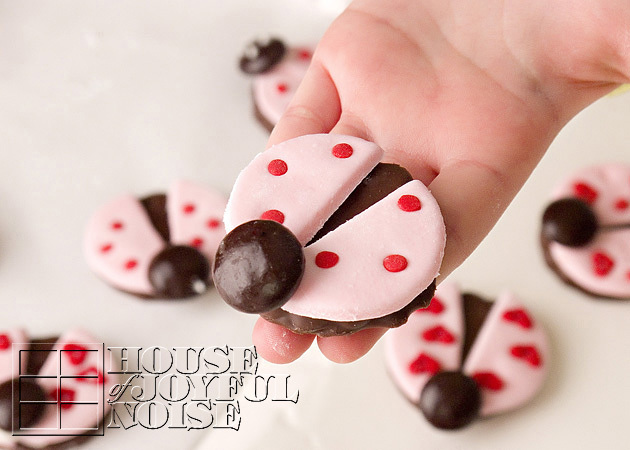 Like a ladybug’s wings, slightly spread. Pipe a little dab of icing on the back/flatter side of a Junior Mint candy…..
….and stick on the head. All that is left to do, is decorate the wings a little! 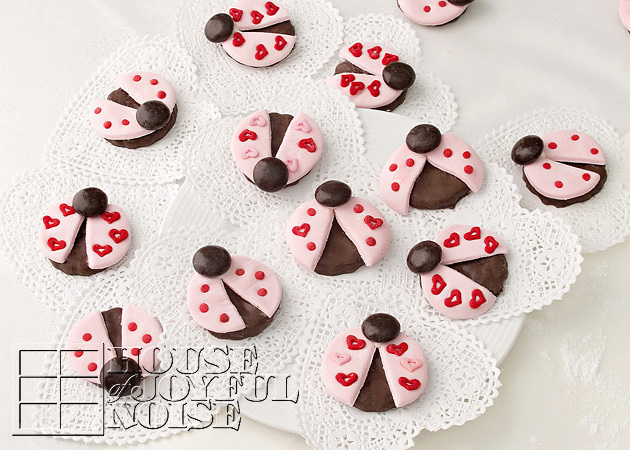 We tried to arrange them, like the dots usually on the wings of a ladybug, as we recalled. 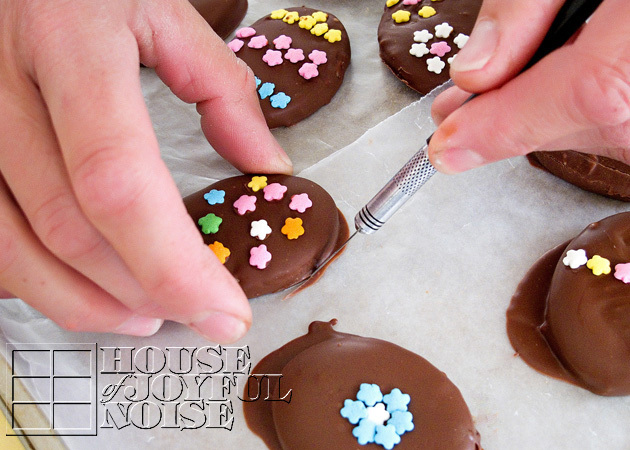 You do want to be sure, that you press the decorative sprinkles down into the fondant. You may even want to add a dab of water? (Didn’t try that). 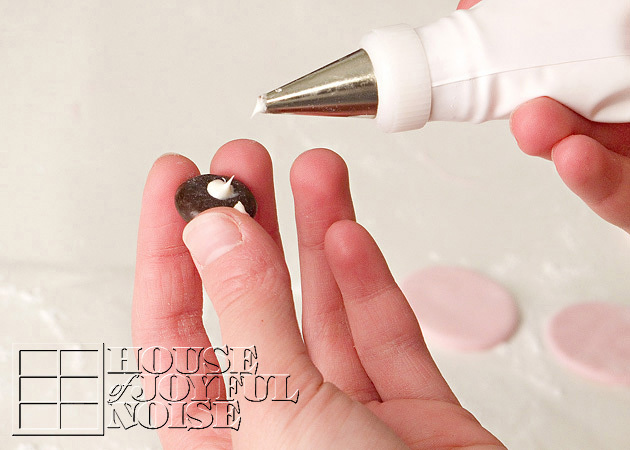 If the sprinkles aren’t pressed down enough, they’ll fall off when the fondant sets up more. THAT’S IT!! How CUTE are these? How EASY are these? You can make a whole bunch, in no time at all. And it’s fun! Our kids all got in on the action! They were on their own (the three younger ones are 9 years old here.). 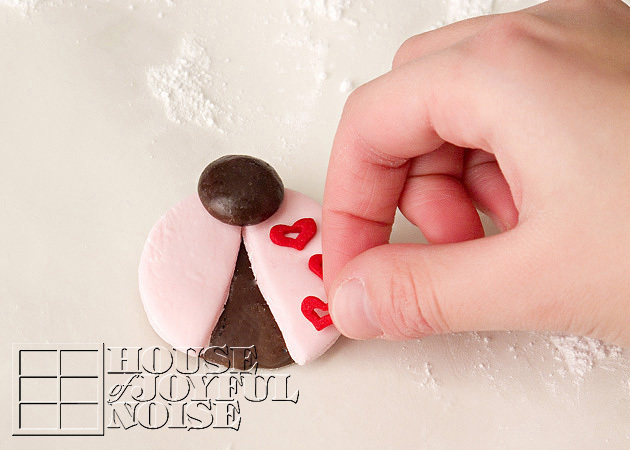 But even younger ones can put these cookies together with a little help! 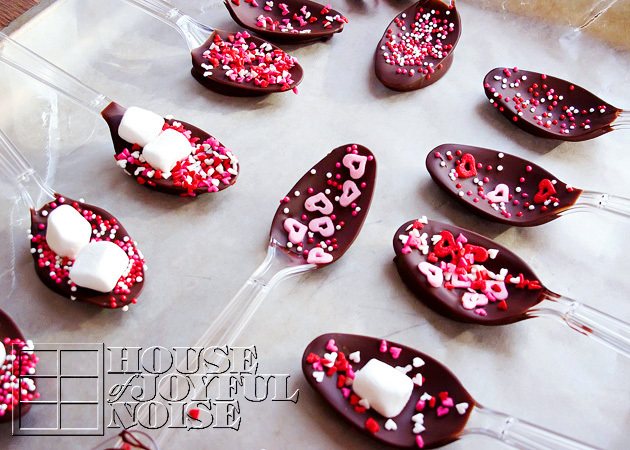 We used the red cots from Confetti Sprinkles too. 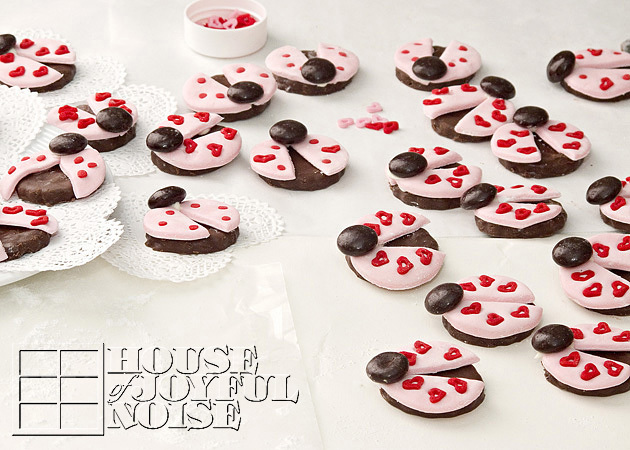 If you think about it, you could use some alternative ingredients, to make these cookies similarly as well. Oreo cookies could be cute. Dark brown M&M’s can be used as heads. (They are not peanut safe, for us.) Use your imagination! Just for fun, can you spot the ladybug, who’s wings were cut too big? We hope you liked this cute little idea. Share it. 🙂 And thanks for stopping by the House! Stay tuned, for more thoughts and shares on the way! Valentine’s Day related, and otherwise. The rest of my family loves anything made with cranberries. But loving these muffins came as a big surprise to me, the first time my daughter made them. 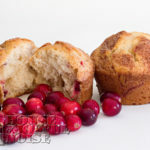 Reason being, I personally have never cared much for cranberry bread of any kind. I figured, it was cranberries, period, that I didn’t like. And between you and me, that felt a little wrong, and perhaps a bit of info I should keep to myself, living in an area simply surrounded by cranberry bogs, and in the town that until fairly recently) was the home of Ocean Spray Cranberry World. You’ll also never hear me say “Pass the cranberry sauce” at the Thanksgiving table, either. Although, I don’t mind a little spread on 2 slices of toasted bread with plenty of mayonnaise, when making my turkey sandwiches in the following days. I do enjoy cranberry juice now too, and with Ocean Spray still nearby in Massachusetts, there is plenty of that around. At many warm- seasoned waterfront events, representatives of Ocean Spray are often set up giving out free samples of their large variety of juices. So….they were bound to grow on me, so to speak. 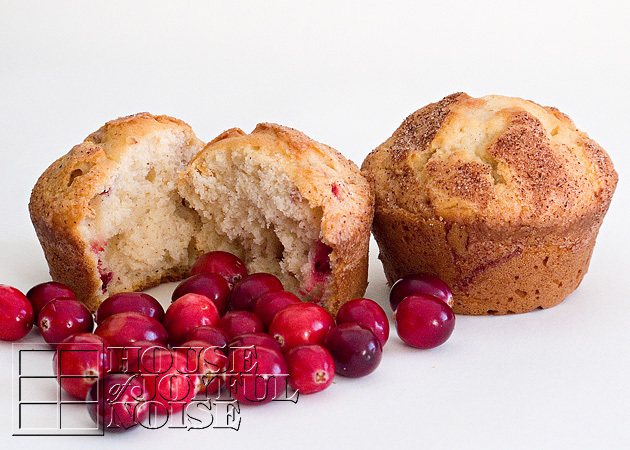 Cranberries are wonderful to decorate with, too! I especially love using them with my winter ice sculpture yard decor! They add such a beautiful splash of color, against winter. In the next year or so, we plan to take a cranberry-related field trip or two, with the kids. 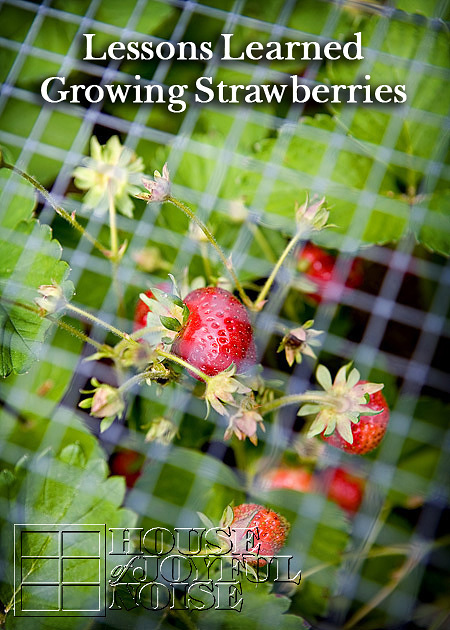 So you’ll likely be seeing some interesting educational information and photos about cranberries and cranberry bogs around here, in the future. And perhaps more recipes as well. We hope you enjoy this one as much as we have. In a mixing bowl, cream together butter and sugar. Add eggs and vanilla; mix well. Fold in sour cream. 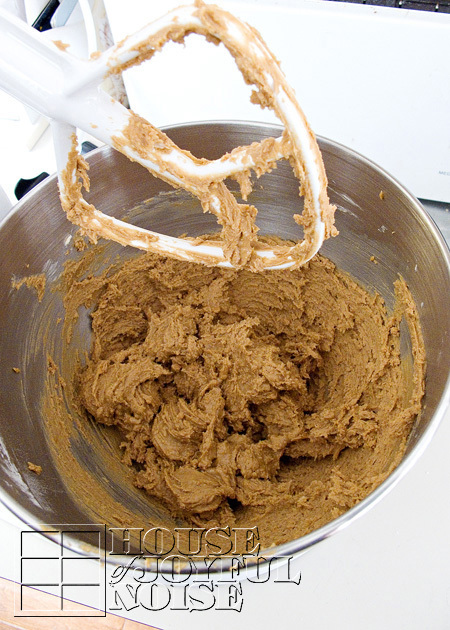 Combine flour, baking powder, baking soda, cinnamon, and salt; stir into creamed mixture just until moistened. Fold in cranberries. Fill greased or paper lined muffin tins 2/3 full. Combine topping ingredients; sprinkle over muffins. 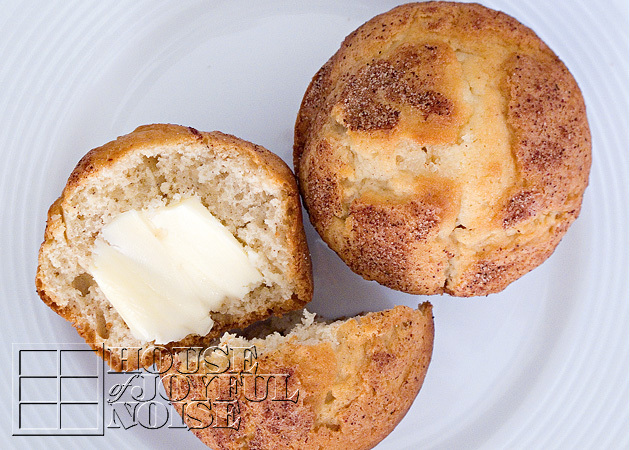 Bake at 400 degrees F for 20-25 minutes, or until a toothpick, or until the muffins test done. Cool in pan 10 minutes; remove to wire rack. When completely cooled, store in a container. Enjoy!…Warm or cold, with or without butter.